Save money, preserve your clothing, and protect the planet every time you do a load of wash. Here’s how! Wear. Wash. Dry. Repeat. As long as you and your family want fresh, clean clothes, somebody’s got to do laundry. Fortunately, that eternal task can be far more efficient, economical, and environmentally sound than ever, thanks to the latest generation of ENERGY STAR certified washers and dryers that cost less to operate and minimize wear and tear on fabrics, all while doing their part to benefit the planet. If all the clothes in the United States were washed in ENERGY STAR certified machines, we could prevent the release of more than 19 billion pounds of carbon emissions annually—the equivalent of the pollution from 1.8 million vehicles! 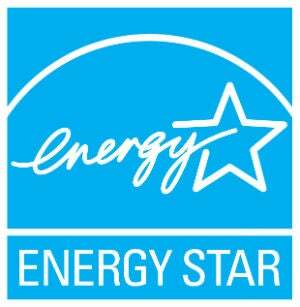 Clothes washers and dryers that earn the ENERGY STAR are independently certified to save energy. More than simply energy efficient, these wow-worthy new appliances boast cutting-edge advances like high-pressured spraying, and most have eliminated agitators, which means they’re gentler on your clothes and better for washing bulky items like comforters. WIN AN ENERGY STAR CERTIFIED WASHER AND DRYER FROM KENMORE! Exclusively on BobVila.com, you can enter to win an ENERGY STAR certified washer and dryer that will make laundry day a cash-, clothes-, and earth-saving pleasure! Don’t miss your opportunity to receive a Kenmore Elite Smart 4.5 cu. ft. Front-Load Washer with Accela Wash® and either a gas- or electric-powered Kenmore Elite Smart 7.4 cu. ft. Dryer with Accela Steam™ technology—plus two laundry pedestals with storage drawers to support the set. For the best possible chances of winning, enter once a day, every day, until the contest closes on May 31. Enter now! Indeed, laundry day has never been easier for Mom, Dad, and even the kids, and this may be having a positive effect on the division of household chores. A recent survey found that 41 percent of millennial fathers claim to be the main laundry-doer at home, while another discovered some 60 percent of men age 35 to 54 now do their own wash—a huge increase from previous years. These washers and dryers, equipped with the kinds of technological features that guys simply can’t resist, stand to feed that growing trend. 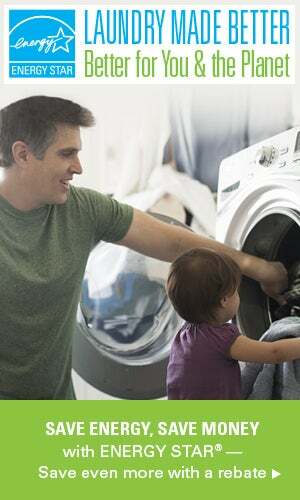 So, if your laundry list includes an appliance upgrade—or if you’re getting a head start on a great Father’s Day gift—keep your eyes peeled for the ENERGY STAR label. But first, read on to learn why these washers and dryers are bound to impress! Why Choose a New ENERGY STAR Washer? Conserving precious resources should be top of mind when you’re shopping for a new appliance, so it’s worth noting that clothes washers that have earned the ENERGY STAR use 25 percent less energy and 33 percent less water than standard models. Over the lifetime of one of these standard-size ENERGY STAR models, that equals a savings of 1,000 kWh (or more than 3.6 million BTUs of natural gas) and 22,000 gallons of water! Translating this figure into cash savings, we’re talking $35 a year on utility bills, or $370 over the lifetime of one of these highly efficient units. Remarkably, if all laundry in the United States were washed in ENERGY STAR certified machines, we’d save $3.3 billion annually! The best news is that all this saving comes with superior performance. These washers are equipped with sophisticated new systems and design features, including innovative lift and tumble action that replaces the old-fashioned central agitator, to clean clothes without wasting water, detergent, or energy. They also boast more efficient motors that spin up to three times faster to extract maximum moisture, which translates into less dryer time (and even more energy savings). Yet the machines also manage to be gentler on fabrics, so clothes last longer, and there are even cycles that are safe for delicates like silk and wool. Teaming an ENERGY STAR washer with a compatible certified dryer yields even greater savings. Clothes dryers that have earned the ENERGY STAR use about 20 percent less energy standard models. If all Americans dried their duds in ENERGY STAR certified machines, the energy cost savings would reach $1.5 billion each year and prevent the release of 22 billion pounds of carbon pollution annually! These dryers offer features like low cycle settings, a steam cycle to stave off wrinkles, and sensor shutoff to prevent over-drying and preserve fabric integrity. You’ll also find high-tech heat pump dryers on the market that recirculate ambient air to maintain dryer temperature; these models can use up to 60 percent less energy than conventional dryers. Lower bills, longer-lasting clothes, and a healthier environment? What dad—or mom, for that matter—wouldn’t love that? So don’t just wish upon an ENERGY STAR! Get the washer-dryer setup sure to make your laundry day dreams come true! This article has been brought to you by ENERGY STAR.